The Okavango Delta in Botswana is a wilderness of beauty and drama. Although it's a high cost holiday, visitors are guaranteed great game sightings and luxury in the bush. Another day dawns in Africa as the sun rises in the Okavango Delta. The sky tinges pink and the watery landscape is bathed in a soft light as we drive through a shallow floodplain. The dry smell of dust mingles with the sweet aroma of flowers from a sausage tree.I'm on a game drive at Duba Plains, a pristine area in the remote northern reaches of the delta that is famous for its lion and buffalo encounters. In the grassland ahead, a herd of 500 buffalo are peacefully grazing. Wattle starlings and white cattle egrets lift off from their backs and scatter in the air.Suddenly the bulky beasts tense and all stare in one direction. Eight lionesses are approaching through the yellow grass. With pricked ears, the cats stalk slowly towards the buffalo. These felines are focused and pay no attention to our vehicle as we follow their every move.They approach closer and now the buffalo are aware of the imminent danger. A lion rushes forward and is chased away by a big bull with lowered horns. There's a standoff and the tension is palpable as the hungry cats eye a baby calf. Dust flies everywhere as the eight lionesses pounce, taking a stranglehold on the buffalo's throat.Then, striding up majestically, a male lion arrives. With a low roar and a flick of his paw, the females scatter, leaving him to grab the calf and drag it still kicking to a shady bush. My adrenalin surges as I watch the harsh reality of the wilderness. Drama and death are ever present in the Botswana bush.For Capetonians, Botswana has always been a distant destination. But now the delta's wildlife and aqua adventures will be far more accessible to those of us living at the coast. Air Botswana have started direct flights from Cape Town to Maun which means that the Okavango Delta is just two and a half hours away.From Maun, it's a 40-minute Cessna flight to Duba Plains Luxury Camp in the far northern part of the delta. The camp belongs to Wilderness Safaris who owns exclusive lodges in remote parts of southern Africa. In 2003, Wilderness Safaris won the highly acclaimed World Legacy Award for their conservation efforts and support of local communities.Accomodation is in six large raised tents, each with an en-suite bathroom and a veranda overlooking the floodplain. As with all camps in the Wilderness Safaris portfolio, Duba Plains is an unfenced camp and animals, including lion and elephant, often walk through the grounds at night. Guests are always escorted to and from their tents by a guide.After a light lunch and quick siesta, we head out on an afternoon game drive. The sun sinks low as Kabelo our guide steers us across a waterlogged floodplain. A flock of birds fly in formation through the crimson sky. Just this morning I was in Cape Town but already the city stress seems a long way away.Up ahead, almost camouflaged in the yellow grass, the Tsaro pride of lions lie sleeping. Their bellies are bulging from a buffalo they killed earlier today. Nearby we find the remains of the carcass. It's been totally devoured and all that's left are the skull, skeleton and hooves. A lone jackal and two vultures pick at the bones.The next day, it's time to move on to Jacana Camp. Transport between camps is by small aircraft and always takes place over lunchtime, outside of the prime game viewing hours.From the landing strip, it's a short boat ride to the camp, situated on a small wooded island. It's a beautiful blue-sky day as we wind through the twisting channels where squacco herons, fish eagles and malachite kingfishers fly from the reed beds as we pass.On arrival at Jacana, I'm met by an impressive welcoming committee - managers Martin and Tania, and Jack, a 50-year-old bull elephant wading just five metres from our boat. 'Quite a reception, don't you think,' says Martin, standing dead still on the jetty as Jack plods past unperturbed.Activities at Jacana Camp are water-based with the highlight being a mokoro trip through the shallow channels. All the big game species are found here and there are large populations of red lechwe and sitatunga.That night after dinner, the makalani palm trees start to rattle. Jack's back and he's brought along a few friends who seemed determined to shake loose some of the makalani nuts. I'm escorted to my tent and prepare for bed when suddenly there's a huge crash outside. Nuts come tumbling down and I shine my torch into the darkness. Looking back at me are the yellow eyes of an elephant.The next morning after a fiery sunrise, we set out on a mokoro trip to a nearby island. A light breeze ruffles the water as my guide George Tembo poles us smoothly through the clear shallows. Occasionally we stop to watch red lechwe grazing and to photograph the green and purple water lilies.At the island, George gives instructions before leading us on a hike into the bush. 'This is a nature walk but we could come across wild animals so stay in single file and keep talking to a minimum. 'We walk in silence and suddenly George comes to an abrupt halt. 'These are fresh buffalo tracks and he could still be around. A lone buffalo is the most dangerous animal to encounter on foot so we need to get away from this thick vegetation,' warns George.We stop several times to inspect buffalo dung and lion tracks. George also shows us the roots of the red star apple plant and demonstrates how the locals use it to brush their teeth. 'It works really well and helps to prevent gum disease. It also saves a lot of money on Colgate,' he smiles.My time in the delta passes quickly and I settle into the wilderness schedule of early mornings, inter-camp flights and game drives at sunset. At Chitabe Camp I'm fortunate to witness two lions mating. Another exciting encounter occurs while eating dinner under the stars at Tubu Tree Camp. Two male lions arrive from the darkness and walk past our table, just 40 metres away. It's too close for a frightened British guest who flees for the safety of the lodge.But I've left the best place until last. Overlooking a lagoon filled with hippos, Kings Pool Camp in the Linyanti Wildlife Reserve is one of Wilderness Safaris premier camps. Accommodation here is luxurious with nine tented suites, each boasting a large bathroom and a lounge area decorated with dark wood furniture and leather chairs. Outside is a private sundeck with plunge pool and a shady sala overlooking the Linyanti River.The wildlife here is prolific and on my final game drive we encounter several breeding herds of elephants. Then, just after sunset, I have my first leopard sighting. It's an exciting moment as she walks right past our vehicle, her eyes fixed on a distant impala.The next day back in Cape Town, culture shock sets in as I readjust to a life of buildings, cars and noise. 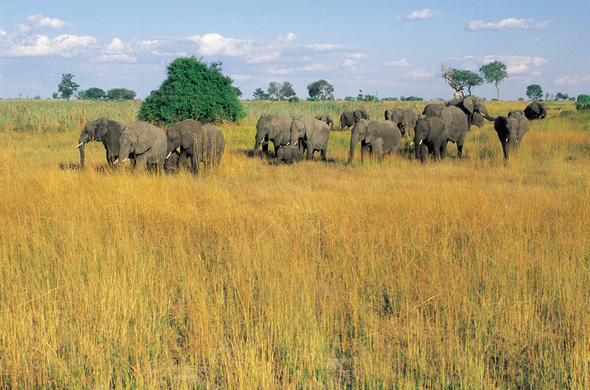 But it's heartening to think that the beauty of Botswana is just over two hours away.Copyright © 2004 Jeremy Jowell. All rights reserved. Reproduction in whole or in part without the permission of the author is prohibited.